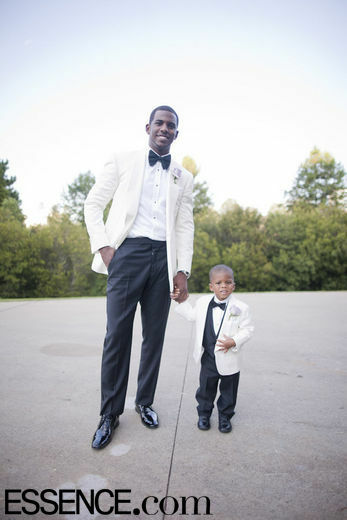 Essence magazine posted photos today from the couple’s recent wedding in North Carolina, including some too cute pics of their 2-year-old son, Chris Paul II in tiny black tie. Here's a sneak peek at what you'll see in Essence. The bride, Jada Crawley, 27 wore a beautiful figure-flattering, pleated gown by Vera Wang, while the groom, New Orleans Hornets guard Chris Paul looked dapper in a white dinner jacket by Ralph Lauren, black tuxedo pants, and traditional patent leather shoes. Jada’s seven bridesmaids (including Savannah Brinson, longtime girlfriend of LeBron James, who was a groomsman) wore purple dresses by Watters. The wedding took place at Ballantyne Hotel & Lodge in Charlotte, N.C., the couple’s home state. Vera Wang, bridal designer to the stars, hit it on the mark yet again. She was the designer behind Kim Kardashian’s excessive, three-gown wedding wardrobe, as well as the wedding dresses worn by Chelsea Clinton, Ivanka Trump, and, another basketball bride, LaLa Vazquez, for her wedding to Carmelo Anthony.